Is the Internet a great meritocracy where the finest will automatically rise up to the top? This is the idea that believes that the Internet is a potent force that brings together the collective power of the ‘market’ to sift out the wheat from the chaff and bring the best to the top where it should be. In other words, you get what you deserve on the Internet. This idea is most pervasive in the world of start-ups, where ardent belief in this ideal is the only fuel that drives entrepreneurs to extraordinary effort. But does this idea reflect the reality of the Internet? Unfortunately, as in all ideologies, there are some elements of truth to it. But when you ignore the times when reality and ideology does not meet, your Internet business will suffer—you will waste resources, time and effort on strategies that do not work. So, this article will focus on the situation where the Internet fails to function as a meritocracy. Hopefully, that will help you be more discerning and save you from going the path of disappointment. At first glance, the Internet should help facilitate meritocracy. After all, it is closest to the ideal free market, where what economists call “perfect competition” happens. But unfortunately, this doesn’t quite work out in reality. “Perfect competition” can and do fail on the Internet. The end result is that the bests and finest do not end up in a position they deserve. If you believe otherwise, you will spend disproportionate amount of effort in crafting the best quality product that will not end up improving your business’s bottom line. So, what is the biggest barrier to meritocracy on the Internet? The short answer: finite limit of the human brain. The longer answer? Read on. Say around 15 years ago, when the Internet was still relatively small, companies like Yahoo attempted to categorise websites into their directories by hand. But the Internet grew so much so quickly that it became clear that that was a pointless project. To put it simply, there’re too much stuffs on the Internet. To categorise and organise everything on the Internet in time is simply impossible. It is too messy, unruly and wild to resist human attempts to put everything nicely into boxes. So, what was the solution? The idea of search engines is this: forget about organisation and categorisation—just throw everything into this big heap and do an efficient search instead when you need something. Today, Google is the largest search engine. But if you notice carefully, search engines are everywhere on the Internet—in iTunes, Amazon, eBay, oDesk (search for freelancers and contractors), web-based emails, AppStore, Google Play Store and so on. Even with search engines, the root problem still remains—there’re still simply too much stuffs in search results. So, another solution is required—feedback and reviews. So, search results from iTunes, Amazon, eBay and oDesk employs some kind of peer rating and feedback mechanism to quickly sort out the wheat from the chaffs. For example, in Apple’s AppStore search results, you can see your peers’ rating of the apps and their opinions. This mechanism save you time by doing filtering away the lousy and mediocre for you. Now, do you see where the problem is? As I mentioned before, there is a finite limit on the human brain. But the explosion of information in today’s hyper-connected modern way of life is far too much for the human brain to cope. Too many things are happening too quickly. Our lives are too complicated, there’re too much information to digest and too many choices to make. So, we become too lazy to sift through the mountains of search results to find the best or most appropriate. We become dependent on the rating and feedback mechanism as a mental shortcut to help us sort through the mess. In the case of Google’s search, we just look at the top few search results, trusting that Google will do the curation for us. Google, in turn, depend on the masses (that is, us) to do the curation (see Which is more effective for SEO- quality content or brown-nosing?). When we do that, we implicitly assume that others are doing the hardwork of curation for us. Furthermore, the more we believe that the ‘free market’ of the Internet is efficient at sifting the wheat from the chaff, the more faith we will have in this mechanism in bringing out the best and finest to the top. But if everyone is thinking the same way, who’s the one doing the hard-work of sorting, filtering and curation? Well, the answer is no one. As a result, a vicious cycle kicks in. New entrants into the market, no matter how excellent in quality, do not have any track record in peer ratings and reviews. Hence, they will appear at the bottom of the pile. Because they are at the bottom of the pile, they will not be noticed. Since they will not be noticed, they will not be rated and given review. Hence, they remain near the bottom of the pile. The converse is true for those near the top. They receive the lion’s share of attention, which in turn receive the lion’s share of ratings and reviews, which in turn further entrench their top dog position. This is the same for Google search results. The top ranked sites gets all the attention, which get them linked and mentioned by others, which further help them entrench their position at the top. That explains why the Internet is so full of winner-take-all phenomena. The winner gets bigger and bigger while the loser becomes smaller and smaller. To be successful, your Internet business strategy must find a way to break this vicious cycle. Sometimes, luck plays a part in bringing in a circuit breaker (eg a mention in the media). But you can’t rely on waiting for luck as a strategy. For big businesses with deep pockets, the easiest way is to throw money to buy attention (eg big PR campaign, saturation advertising). But for small businesses, you need a better way. There is one, and it is diametrically opposed to what every big company marketer in the world does. 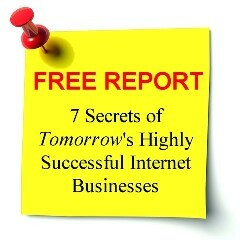 That way is revealed in my paid report, Secrets of Tomorrow’s Highly Successful Internet Businesses. Note: This report is the upgraded version of the free report, 7 Secrets of Tomorrow’s Highly Successful Internet Businesses. It contains new and expanded insights that will only be revealed to our paid customers. Posted in Strategy and tagged long tail, meritocracy, winner-take-all.